About 4-5 km further on, turn left onto the Tothill Belt road. This is the main dirt road through this valley. You have just climbed over the range that will be the site for many Wind Turbines that will be built along it over the next few years. Has caused some friction between the local farmers as some will be allowed to have the turbines ( and be paid rent for their land, and some will miss out! ). Drive north for about 4km and turn right at the T junction into the Black Springs Road. This takes you through the gap in the range. After about 1km swing right at the intersection to follow the Black Springs road to head south east for about 2km where you need to watch out for a side road with a sighpost that directs you to either World\'s End or Burra Gorge. This is called the Halleluja Hills Road on Google Maps. It is a nice drive for a few kms along a winding road between the hills until you meet the bitumen road called the World\'s End Road. Turn left and head up to have a look at the Burra Gorge if you can spare ten minutes. A great spot to camp if its that time of the day! The turn off into Burra Gorge is about 3km north of where you hit the blacktop from the Halleluja Hills track. ( On Google Maps its called tWorlds End Gorge ). From here head north to the T Juncction with the Burra to Morgan highway. Turn left and if you have never been to the historic town of Burra before its worth a look. 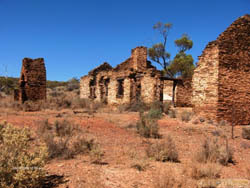 Burra was famous for its copper mine about 100 - 150 years ago. It provided a great number jobs for Welsh immigrant miners, and great amount of revenue for the growing state of SA. 3 or 4 km before reaching Burra, turn east along the Eastern Road and head down to the Carooma Rd about 5 km from the Burra - Morgan highway turnoff. Turn north along this road and travel for another 3-4 km to the fork in the road. Take the left branch to Mongolata station, throught the first of a few station gates. ( There are about half a dozen gates to negotiate as you wind your way through the old Mongolata sheep station.) After about 7-9 km you leave the station behind, cross a concrete ford through shallow water ( depending on recent rainfall! ) and the road becomes part of the Mawson bike track that actually heads right up into the Northern Flinders Ranges! It is quite scenic around here. From the ford continue in a northerly direction along the raod ( Mawson Track ) until you meet the Dare\'s Hill Summit road. Turn right at this intersection and be prepared to stop at the summit. A great view across a rugged valley below that you will soon be traversing, and watch the track head norht east into the distance. A great drive through the valley below, following a creek ling takes you past some wonderful ruins of the old Collinsville station, about 3 - 4 km from the summit, and then another 4 km further along is the new homestead. About 500m before the new homestead take the road to the left to Mallet homestead I I think deserted by the look of it ) which is about 4km north. At the T junction at Mallet turn right and head east to the ruins of the old Ketchowla station. Some lovely old buildings to see here. Google maps calls this Pine Creek, but the NATMAP topographic 1:250 000 scale I bought from my local 4WD shop calls this Ketchowla. From here I headed east along the Pulpara Road to meet a North - South track that comes up from the Eastern Road I mentioned before. Turn north at this intersection and turn right at the next intersection about 3-4 km further on to head out towards Loch Winnoch homestead ( deserted ). The track heads off the edge of the BURRA map ( NATMAP S154-05 and you need to pick it up on the next map - CHOWILLA. Follow the track up through Braeside homestead (occupied), Lillydale ( occupied), and on to the next map OLARY. From Mallet to Lillydale you are really out in the wilderness. Very peaceful. I saw no other vehicles between Mongolata and Lillydale. So be prepared! ( Food, water, UHF, another vehicle to share the trip if possible. The north - south track I mentioned ( about 12-15 km east of Ketchowla ) had only one other wheel track across the clay surface, and that might have been weeks old given the dry summer weather! The last 70km from Lillydale to Yunta felt like I had returned to civilization because you pass through three or four lovely old station properties (all inhabited), with glorious old buildings to admire. There are also some very gree patches of vegetation and lovely river beds lined with big river red gums and thick undergrowth. I think there must be a few springs scattered around. Great to see the green patches after hours of dry country in 40 degree heat! I finished my trip at Yunta at about 4.00 pm after leaving Burra Gorge at 7.00 am in the morning. Then the return back to Adelaide to be home later that night. Really enjoyed the trip after pouring over the Google Maps for a few weeks before and trying to imagine what this part of the state was like \'on the ground\'. It was my second trip in the old Nissan since buying it a few weeks before. Let us know if you follow my route and how it went for you. Happy wandering, John.